Please check this Agreement periodically for changes as the Owner of this site Assembly-Jobs.com reserves the right to revise this Agreement and your continued use of this site following the posting of any changes to the Agreement constitutes acceptance of such changes. The Owner reserves the right to terminate a User's use of this site at any time without notice and may do so for any breach of this Agreement or the instructions on this site by User. This Agreement applies to licensors and advertisers as well. Except as may be explicitly permitted through this site, you agree not to save, download, cut and paste, sell, license, rent, lease, modify, distribute, copy, reproduce, transmit, publicly display, publicly perform, publish, adapt, edit, or create derivative works from materials, code or content on or from this site. Systematic retrieval of data or other content from this site to create or compile, directly or indirectly, a collection, compilation, database or directory without written permission from the Owner is prohibited. In addition, use of the content or materials for any purpose not expressly permitted in this Agreement is prohibited. Assembly-Jobs.com and its content providers make no representation to you that materials at this site are appropriate or available for use outside the United States, and access to them from territories where their contents are illegal is prohibited. You may not purchase, use, export, or re-export the materials at this Site or any copy or adaptation in violation of any applicable laws or regulations, including without limitation U.S. export laws and regulations. If you choose to access this Site from outside the United States, you do so on your own initiative and are responsible for compliance with applicable local laws. These Terms will be governed and construed in accordance with the laws without giving effect to any principles of conflicts of laws. Any action to enforce this Agreement shall be brought in the federal or state courts. Inclusion of all Terms. All other notices, policies, disclaimers, and other terms contained in this site are incorporated here by reference. In the event of a conflict between such other terms and these Terms, these Terms shall control Severability. If any provision is deemed to be unlawful or unenforceable, that shall not affect the validity and enforceability of the remaining provisions. We do not issue any refund. Since our products are in a digital form, we do this to protect our company. You may be transferred to online merchants or other third party sites through links or frames from this site. You are cautioned to read such sites' Terms and Conditions and/or Privacy Policies before using such sites in order to be aware of the terms and conditions of your use of such sites. These sites may contain information or material that is illegal, unreasonable or that some people may find inappropriate or offensive. These other sites are not under the control of the Owner, are not monitored or reviewed by the Owner, and the Owner is not aware of the contents of such sites. You acknowledge that the Owner is not responsible for the accuracy, copyright compliance, legality, decency, or any other aspect of the contents or any transmissions received through such sites. The inclusion of such a link or frame does not imply endorsement of this site by the Owner, its advertisers or licensors, any association with its operators and is provided solely for your convenience. You agree that the Owner and its licensors have no liability whatsoever from such third party sites and your usage of them. Owner may suspend or terminate this Agreement or User's use immediately upon receipt of any notice which alleges that User has used this site for any purpose that violates any local, state, federal or law of other nations, including but not limited to the posting of information that may violate third party rights, that may defame a third party, that may be obscene or pornographic, that may harass or assault others, that may violate hacking or other criminal regulations, etc. of its agents, officers, directors, contractors or employees. In such event, Owner may disclose the User's identity and contact information, if requested by a government or law enforcement body or as a result of a subpoena or other legal action, and Owner shall not be liable for damages or results thereof and User agrees not to bring any action or claim against Owner for such disclosure. MATERIALS IN OUR PRODUCT AND OUR WEB SITE MAY CONTAIN INFORMATION THAT INCLUDES OR IS BASED UPON FORWARD-LOOKING STATEMENTS. FORWARD-LOOKING STATEMENTS GIVE OUR EXPECTATIONS OR FORECASTS OF FUTURE EVENTS. YOU CAN IDENTIFY THESE STATEMENTS BY THE FACT THAT THEY DO NOT RELATE STRICTLY TO HISTORICAL OR CURRENT FACTS. THEY USE WORDS SUCH AS “ANTICIPATE,” “ESTIMATE,” “EXPECT,” “PROJECT,” “INTEND,” “PLAN,” “BELIEVE,” AND OTHER WORDS AND TERMS OF SIMILAR MEANING IN CONNECTION WITH A DESCRIPTION OF POTENTIAL EARNINGS OR FINANCIAL PERFORMANCE. DOWNLOAD YOUR *FREE* Work At Home Assembly Jobs STARTER Guide"! 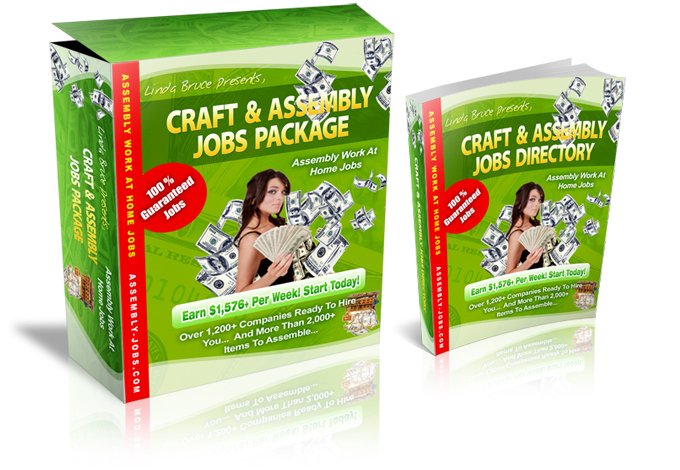 Click Here to DOWNLOAD "Craft & Assembly Jobs Package"! !